Globe7 makes you know the latest and hottest happenings. Customize it to get the News of your interest. VeriLook SDK for Linux. Face identification SDK. Works with web cam. a free PDF document viewer for the Linux platform with streamlined interface. Download full version of free strip poker game with interactive video for PC. t@b ZS4 is a video compositing/editing system with more than 90 custom effects. Qweas is providing links to Globe7 for Linux Free 2.1 Beta as a courtesy, and makes no representations regarding Globe7 for Linux Free or any other applications or any information related thereto. Any questions, complaints or claims regarding this application Globe7 for Linux Free 2.1 Beta must be directed to the appropriate software vendor. 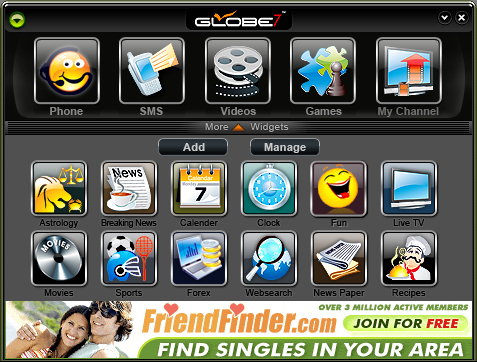 You may click the publisher link of Globe7 for Linux Free on the top of this page to get more details about the vendor.